Making use of some of the finest ingredients, ISLE OF DOGS Coature collection is specifically designed to work with dogs’ coats and appropriate pH. Customized for your dog, depending on coat type, skin issues, and desired style. Unique formulations result in superior performance. Use the 3-step system (shampoo, conditioner, and grooming spray) to complete the ultimate well-being package for your dog. ISLE OF DOGS Jasmine and Vanilla Repláscent 8 oz. Odor-neutralizing sprays for your dog and home, neutralizing bad odors and replacing them with a subtle fragrance. 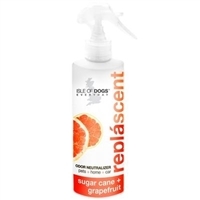 ISLE OF DOGS Sugar Cane and Grapefruit Repláscent 8 oz. 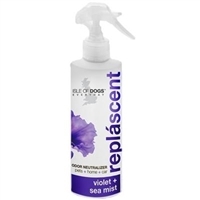 ISLE OF DOGS Violet and Sea Mist Repláscent 8 oz. It’s ideal for dry skin and long hair that needs detangling and added moisturizing. 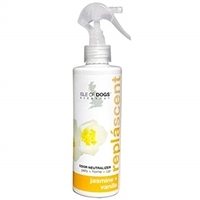 Can be used on all coat types and is great for puppies.